Here's one that could easily miss your radar, especially if you're in the States. But don't let Brunorock's latest, War Maniacs, pass you by. Formed in the early nineties by vocalist Bruno Kraler after time with some obscure German bands, Brunorock has given us three studio and one live album of memorable melodic rock. War Maniacs is no different; from first to last, this is a fine album loaded with attractive arrangements and memorable songs. Don't be deceived by the title: War Maniacs may sound like there's heavy hard rock within, but this is pure melodic rock. Certainly, songs like Breakthrough and Last Ride, have a heavier vibe but nothing pummelling or abusive. Frankly, much of War Maniacs is tempered by the lush vocal arrangements (even though Bruno can sound like Bon Scott at times) and Alessandro Del Vecchio's (Eden's Curse) massive and impressive keyboard presence. Actually, Mr. Kraler may have to watch his back as Del Vecchio, for my money, steals the show on this disc. His input on each song adds a depth of beauty which makes War Maniacs a real delight. In Search of Faith, Time to Run, and Temptations are simply riveting pieces. Ultimately, however, War Maniacs contains a breathless variety of compositions which make for an entirely entertaining work. If there is any disappointment, it may come with the cover of AC/DC's Touch Too Much where Brunorock adds little or no imagination to an already successful song. Hard working and sometimes long suffering vocalist Bruno Kraler delivers a true gem with the latest Brunorock War Maniacs. Accompanied by a talented cast of players, in War Maniacs, Kraler may have created the sine qua non album of his career. Very recommended. 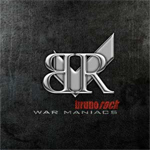 Hard working and sometimes long suffering vocalist Bruno Kraler delivers a true gem with the latest Brunorock War Maniacs. Accompanied by a talented cast of players, in War Maniacs, Kraler may have created the sine qua non album of his career.